Thankfully, spring is around the corner! Now is the time to start thinking about putting away your winter gear and breaking out everything you need for the warm weather that’s on its way. To help our portable storage customers get ready for spring, the experts at A.B. 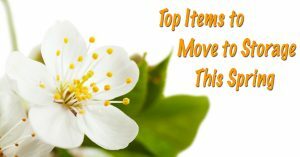 Richards have put together a list of the top winter items to move into storage this spring. They’ve also put together some quick, easy storage tips and reminders to make your spring cleaning a breeze. Winter Sports Gear: Anything related to winter sports falls under this category, including skis, sleds and snowboards, and clothing related to outdoor winter sports and activities. Winter Apparel: Any heavy clothing, such as sweaters, sweatshirts/hoodies, coats, gloves, scarves, hats, boots and shoes, should be stored away to make way for lighter clothing, such as lightweight jackets, pants, skirts, dresses, shirts, cardigans, shoes, sandals, shorts and blazers. Winter Bedding: This includes all heavy comforters, blankets, throws and flannel sheet sets that are designed to add an extra layer of warm on those frigid, wintry days in order to make room for lighter and cooler cotton sheets, throws and bedspreads. Winter/Seasonal Décor: By now your holiday decorations are safely stowed away in mobile storage, but you should also put away all of your other seasonal décor such as anything winter-themed or Valentine’s Day-themed to make way for spring and summer décor pieces. Winter Equipment: And snow removal equipment can also generally be put away for the season once spring arrives. This includes items such as snow shovels, ice scrapers and brushes, salt, sand and kitty litter (which can be used for traction on ice in lieu of salt or sand). Remember, however, any items that are powered by gas, such as snow blowers and snow throwers, should be thoroughly drained of all gas before storing, or should not put inside the storage unit at all. Stowing these items inside one or more portable storage containers from A.B. Richards – the leading supplier of ground-level storage containers in the Northeast since 1982 – will free up precious space in your home for living, working and entertaining and keep it clutter-free. In addition, you’ll have easy and secure on-site access to your items when you need them for next winter. Want to receive more tips? Just contact the mobile storage professionals at A.B. Richards today at (800) 597-5971. For more than three decades, homeowners, businesses, retailers, construction firms and other commercial companies have each relied upon A.B. Richards for all of their portable storage needs. With one phone call, our friendly, knowledgeable staff can answer all of your questions, easily explain our storage container renting and leasing options and get you started right away with the right portable storage units that work for you and your budget.